Make Mead Like a Viking has been out for nearly two months now and things are going well. While I would prefer you buy it through an independent bookseller or through Chelsea Green Publishing, if you like it, please review it on Amazon and elsewhere. If not, review it anyway, but try to be nice. If you want to buy a signed copy for yourself or as a gift, click here. While my newsletters and blog entries aren't put out on any set schedule, I find it fortuitous that I'm finally finding the time to put this one out at the beginning of winter solstice, AKA, Yule. While I don't celebrate Yule, per se, I'm very interested in how early European cultures celebrated this time of the year. For peoples in Northern European climates, with the long dark and cold winters, this time of year was a time of celebration. In part because they had little better to do while huddling over fires in their homes or in communal mead halls, but also because they knew that the sun was heading back their way. Light would once again overtake Dark. Many cold months were ahead, but the days would slowly start getting longer. This was in no way a celebration limited to a single culture though. Many other cultures celebrated this time of year, as it symbolized the beginning of a new year, with all of the rituals and hopes for better tidings that went with that. For a brief summary on what Yule meant to early pagan cultures, see this video. Visit The Asatru Community's page for a more in-depth exploration. These celebrations are by no means dead, as many people still celebrate Yule today. Christmas is essentially a Christianized version of Yule, although not all Christians celebrate it due to its pagan origins. In the Dark Ages, the Roman church wanted to convert more "heathens" (literally, "from the heath," i.e., country folk who preferred the Old Ways) to Christianity. To do so, they changed the Biblical birth of Jesus to the dead of winter rather than the spring. Over time, Yule traditions were integrated into Christmas and Yule fell by the wayside. For those who prefer the pagan aspects over the Christian, Yule can still be celebrated today, right alongside Christmas (or any other culture's winter holiday for that matter). After all, the goal is to bring people together and wish joy and good tidings on all. On midnight, December 21st, Yule officially begins, and Yule eve is celebrated as the "Mother Night." Preparations must be made to cheer on and strengthen Thor as he prepares to once again battle the frost giants of Jotunheim to keep them from turning Midgard (the land of humans) into a land of frost and bitter cold. With our help, Thor will once gain prevent Fimbulwinter, the precursor to Ragnarok (which is not so much the end of the world as it is the beginning of a new one). For 12 days, celebrations will be held with friends and family, with much cheer, drink, food, burning of bonfires, and quiet reflection. December 25th falls right in the middle, and New Year's will be its culmination. During Yule, Jólnir (Odin) will lead the Wild Hunt through the sky, along with the spirits of humans, horses and dogs. This grand procession takes place during all twelve days of Yule, with the intent of reminding our deceased ancestors (the draugar) that they need to stay on their side of the veil, as it as at it thinnest during this period. So, how can you celebrate Yule in modern times and still feel like a Viking while you're at it? 1. One thing you may already do that is a part of the Yule tradition is to bring an evergreen tree into your house and decorate it. This is a pagan tradition at its core, but some choose to do it with their Christian beliefs in mind, or simply as a secular tradition. 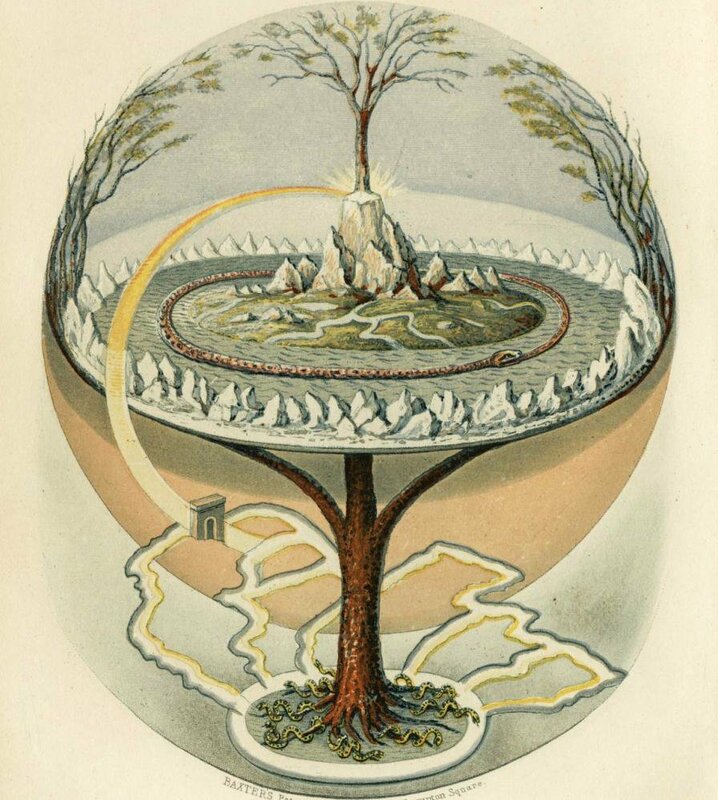 Many cultures integrate the mythos of trees that symbolize life into their beliefs, from the Tree of Life of Judaism and Christianity to the great World Tree of Norse and Germanic mythology, Yggdrasil. This one is up to you. 2. A yule log is another option. In honor of Thor, take the largest oak log you can find (or can handle) and kindle it, either in an indoor fireplace or an outdoor fire. Be sure to save some of its charred remains to use for lighting next year's log. 3. Sacrifice a goat Okay, maybe don't sacrifice it, but goats are associated with Odin and were often slaughtered at this time of the year. After Odin was given his share, any other goats that weren't being saved through the winter were slaughtered. Their meat was either preserved or eaten right away--boiled, pit-roasted, or spit-roasted. Visit here and here for tips on humanely slaughtering and butchering your own goat. 4. Sacrifice a boar. Or just roast up some pork. Either way, continue the tradition of the Oath Boar, during which oaths were solemnly made to Frey over a large boar. Unlike New Year's resolutions, these oaths are meant to be kept. 5. Make some mead. Sorry it took me so long to get to this one but you know this is where I was headed. Of course, you can use some recipes from my book, but here is a handy link on how to make a spiced holiday mead, along with some tips for cooking goat. In addition to the spices mentioned in this recipe, you can incorporate many other spices, from vanilla, to cardamom, to a bit of spruce from the Yule Tree. Make a small mead in time for New Year's or start a tradition of making mead over the holidays that you will age and drink during future holidays. 6. Play some Viking games. The tabletop strategy game Hnefatafl is an obvious choice, but why not pick up a copy of Don't Fall in the Mead Hall for future gatherings? Or, make up your own drinking games. Remember, when the Vikings celebrated Yule in the mead hall, it was all about boasting, oath-making, poetry, dance, and song. Can you hold your own or are you a weak-livered milk drinker? Older PostMake Mead Like a Viking is Finally Here!